Deluxe Camping Near Asheville, NC. Only 10 minutes from downtown Asheville your deluxe glamping site awaits at one of the best campgrounds near Asheville, NC. Lake Powhatan’s glamping tents allow you to experience nature and outdoor recreation without sacrificing the comforts and luxuries of home. Choose one of 12 custom designed, fully furnished canvas platform tents in the heart of the Pisgah National Forest for your next mountain adventure. 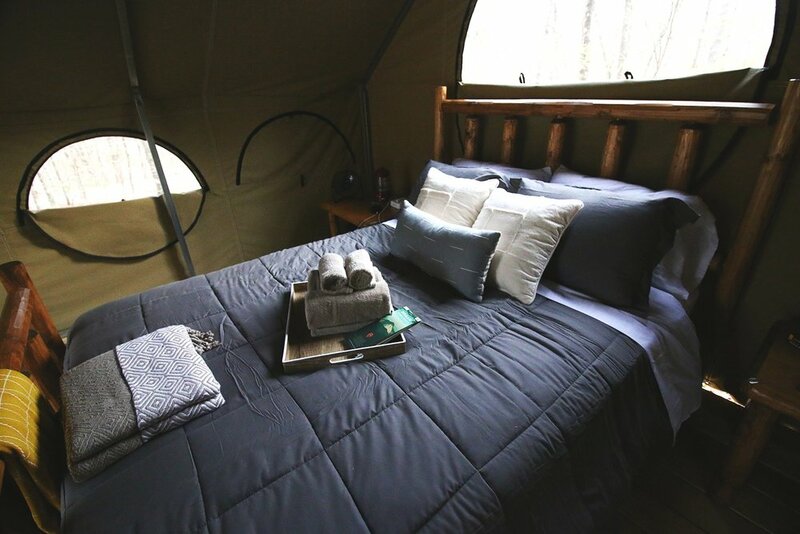 Pisgah Glamping sets the stage alongside the 6,000-acre Bent Creek Experimental Forest and trail system, Asheville’s top destination for hiking and biking. Bring your friends, family or true love—it’s right down the road and a world away. 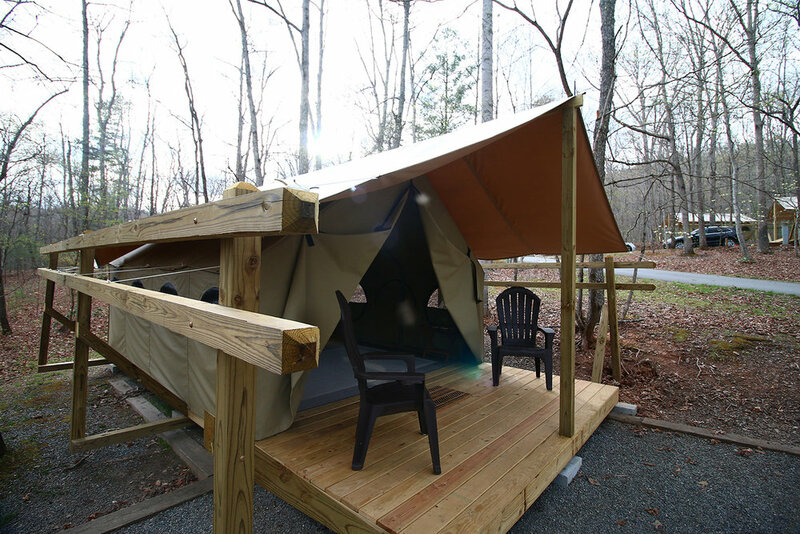 Asheville’s own Diamond Brand Outdoors manufactured 12 custom-designed canvas tents exclusively for Lake Powhatan’s glamping sites. Each 12x16-foot space accommodates up to four guests—it’s fully enclosed with large screened windows providing natural light and protection from the elements. A weatherproof fly adds extra shelter from the rain. Indoor/outdoor chairs are available for relaxing on the raised front porch under the big sky. Glamping in Asheville, NC could not be any easier! Each canvas tent is outfitted with just the right amount of furnishings to provide comfort while leaving plenty of space to stretch out and move around. Come inside to a queen bed dressed with cozy linens (sheets, comforter & pillows included). A foldable cot (which can be tucked under the bed when not in use) offers additional sleeping space, and there’s room on the floor for sleeping bags or an air mattress. A bedside table and luggage rack store personal belongings, and you’ll have access to AC/USB charging for electronics too. If you choose to stay connected, you can! Bathroom facilities are shared with the Lake Powhatan Campground and include hot showers. Read a book or play games on the big front porch! Lake Powhatan Glamping sites come with outdoor furniture for the covered deck. With parking directly beside your tent, you can easily move back and forth with food, gear and supplies. Being minutes from downtown Asheville, you can even bring home leftovers from your favorite restaurant. A picnic table and large fire ring with grill accompany the sites, and there’s no need to bring a bulky cooler—it’s provided, and it’s big enough to hold drinks and refreshments for your entire group! Interior and exterior lighting offer ambiance and convenience, so if you’re out late walking the dog (Yes, pets are welcome! ), you’ll find your way back easily without needing the flashlight. Dreamy indeed. Adventure at your doorstep—literally. Pisgah Glamping at Lake Powhatan sites are an easy 5- to 10-minute walk to beautiful Lake Powhatan where guests can fish, swim or rent boats when lifeguards are present. They’re a short walk to North Carolina Arboretum and are surrounded by one of the region’s best hiking and biking trail systems. The Blue Ridge Parkway and downtown Asheville, NC are a quick drive away. For once, there’s no need to plan. Just wake up and go.